NOTE: If you are teaching multiple common assignments, you will need to submit each common assignment separately using this process. 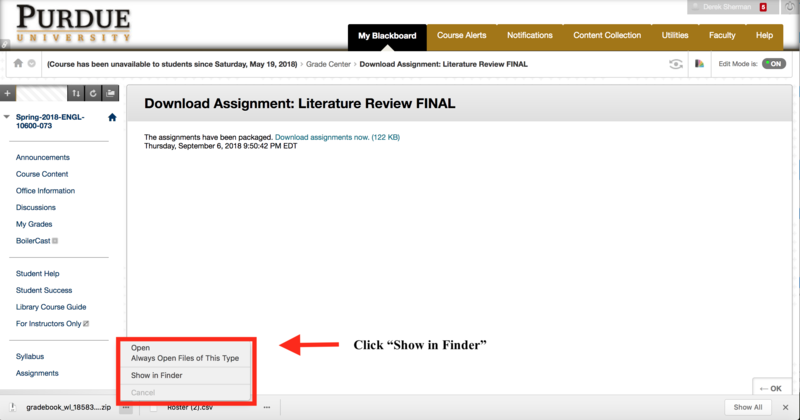 Step 1: Teach the Common Assignment and have students turn in the completed assignment via Blackboard in a .doc or .docx file. You will need to submit clean copies of your students’ assignments. Please leave off all instructor remarks. Step 2: Go to myPurdue and look for “Summary Class List” under the Class List section. Under the "Class List" section in the Faculty tab, select "Summary Class List." On the next page, select the appropriate term. Make sure you click the appropriate CRN, or the one with (20) students, and remember to complete this step separately for each section. The next page to open will be your students listed in alphabetical order, and each student has a “Record Number.” This record number is used in the steps below. 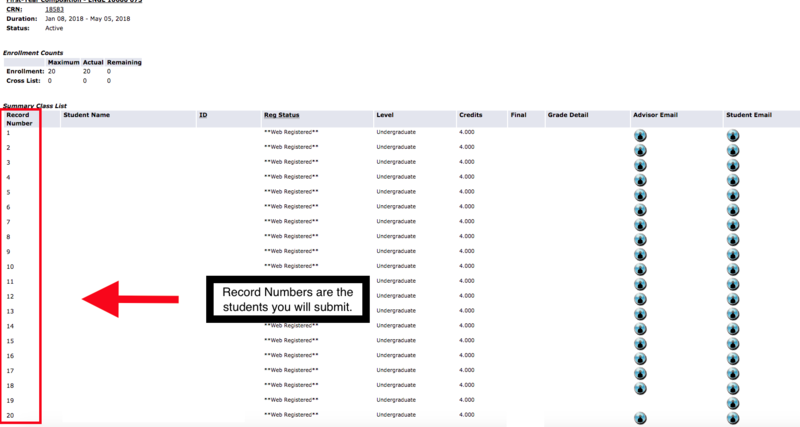 Below are ten randomly selected numbers that correspond to the “Record Number” in your “Summary Class List.” The record number is used to locate the name of the student’s common assignment you will submit. You will not use all ten numbers in the list below, but only the amount requested above. We have listed ten total numbers to account for any students who did not turn in the assignment. You will go through the numbers listed below until you have the total number of requested assignments, skipping any students who failed to turn in the assignment. For example: If you completed the Professional Email assignment, for example, you will submit a total of four assignments. You would submit the students whose names are listed under “Record Numbers” 10, 16, 04, and 08. If student 08, however, failed to turn in the assignment, you would submit student 12’s assignment instead. If 12 failed to submit, you would submit student 20 and so on. Write down the names of the students that correspond to the “Record Numbers” requested below. ***English 106-I instructors have their own number set because of a course cap of 15, and instructors should use this set regardless of common assignment. 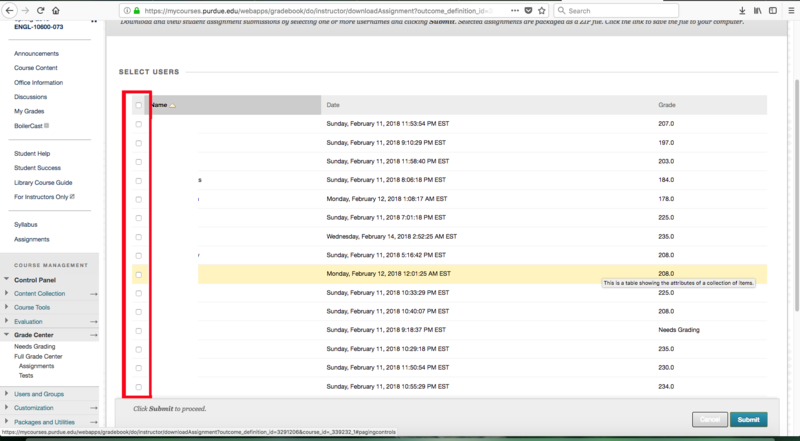 Step 4: Once you have written down the students’ names, go to Blackboard using Google Chrome to begin the downloading process. Step 6: Go to your common assignment and click the “down arrow” next to the common assignment’s name. 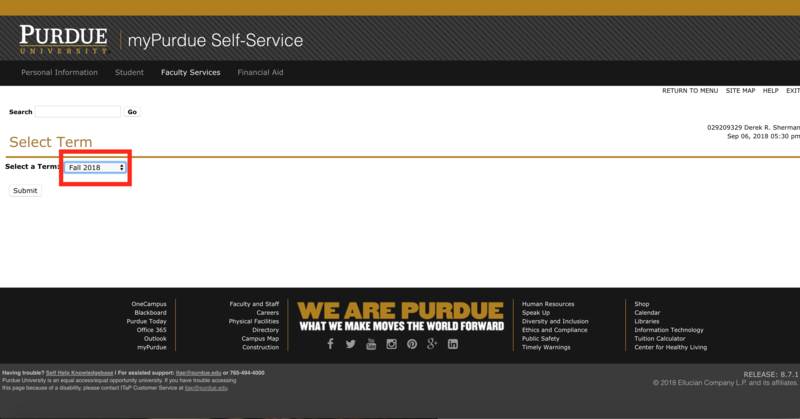 Step 8: Select the names of the requested students and hit submit. 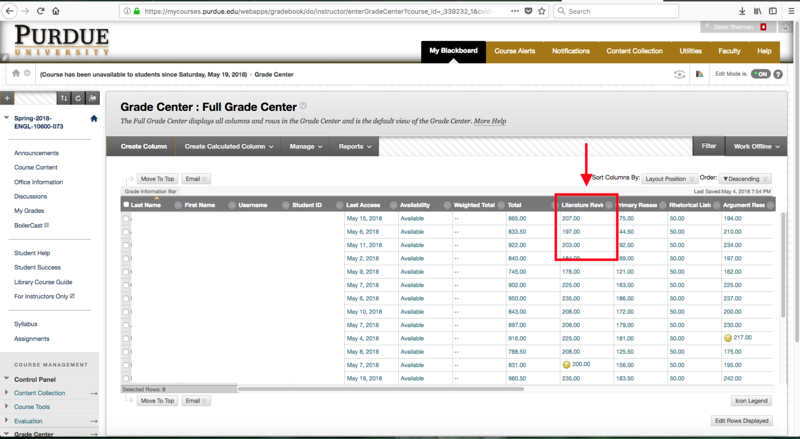 *NOTE: Students’ names may differ from MyPurdue to Blackboard because of student preferences; however, Blackboard still runs alphabetically, so the cell number will still correlate with the appropriate student. 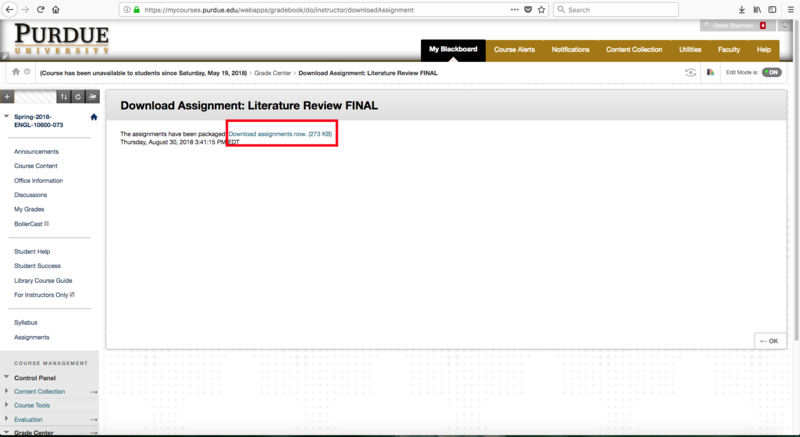 Step 9: On the next page, click on the “Download assignments now” link. Step 10: Once the file has downloaded, click on the “up arrow” next to the downloaded file at the bottom, right-hand corner of the webpage. When the arrow is clicked, a menu will pop up and you will then need to open the file using the “Show in Finder” option. Step 11: After the downloaded file appears, right click on the file to change the file’s name. Step 13: Once you have renamed the .zip file(s), know the location of the renamed file(s) as you complete the final submission found here: ICaP Common Assignment Submission. ****NB: Please make sure you also have a copy of your Common Assignment Assignment Sheet ready. We will need you to upload that as well. 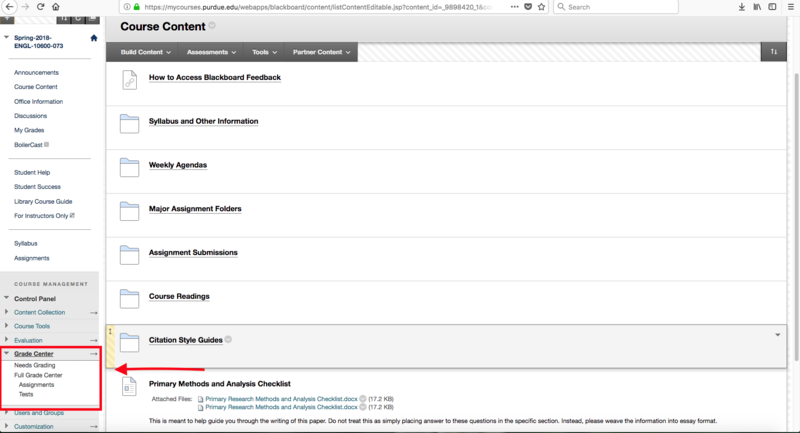 Step 14: Once you have completed the submission, uploaded your files and assignment sheet, and answered the reflection questions, press the “→” to officially submit your common assignment.